Clear plastic beach totes are an easy, breezy way to tote and stow everything you need for a day at the beach. A clear bag allows you to see at a glance what's in your bag, so you can quickly grab what you need, or see if you've forgotten an important item. Plastic material means that the bag won't be ruined by water, sand, dirt, or debris, and can be quickly and easily wiped clean. They are available in both affordable and designer styles. Most plastic see through beach totes are affordable, but there are designer styles available for those who want a luxe look for the beach in this style of tote. Totes may have high quality material, strong structure, and added design elements than their less expensive counterparts. Monogrammed: Designers love to put their names all over their merchandise, which is why monogrammed clear beach totes are one of the most popular styles. A stylish example of one is the Juicy Couture Beach Tote. It features a floral accent and the designer name emblazoned all over in black cursive writing. Frosted: For those that want a slightly more discreet version of a clear tote, you have the option of choosing one that is frosted. What this means is that, while you can still see through the bag, the frosted material is thicker. This offers a silhouette effect instead of an outright view of your bag's contents. MICHAEL Michael Kors Jet Set Jelly North South Tote is a cute, compact example of the frosted tote that is available in vibrant colors and completed with gold hardware and leather straps. Vinyl: A beach tote made from vinyl is not that much different from tradition styles, however the Alexander McQueen version adds his signature designer twist. The McQ Alexander McQueen "Kingsland" Vinyl Shopper contains metal studs along the the handle and shoulder straps, lending to the designers popular gothic aesthetic. It's also a little heavier in weight than other transparent styles. Flexible: The popular Dooney & Bourke brand sells a flexible acrylic carryall that is versatile enough to work as a beach bag. It has rounded handheld handles and is available in medium and large sizes. Target: When you want merchandise that looks expensive, but is instead totally affordable, Target is definitely the place to go. Their tote bag selection is trendy, colorful and oh-so irresistible. Old Navy: You won't find any designer brands at this family-friend store, but you will however, find a wide selection of colorful totes suitable for the whole family at an affordable price. Macy's: Features a massive number of top designer handbags and totes. The best thing is that you can often find consistently new styles from some of the most in-demand designers in the business like Michael Kors, Calvin Klein, Guess and Ralph Lauren. TJMaxx: Great for those that love designer totes, but don't love the expensive pricetag, T.J. Maxx is one of the best places to get normally pricey bags at closeout prices. Bonus: their selections are constantly updated, so you'll always find new styles. Some designers include: Diane Von Furstenberg, Kenneth Cole, Versace and Fendi. Marshall's: Almost like a cousin of sorts to T.J. Maxx, Marshall's also offers big name designer brands at clearance prices. The chances of you finding your dream clear beach tote are quite large. Some featured designers are: L.A.M.B., Cynthia Rowley, DKNY and Prada. Dillard's: Home to big name brands and smaller ones, this department store has an impressive fleet of tote bags, sure to please even the pickiest ladies around. Regular designers include: Coach, Dooney & Bourke, Cole Haan, Steve Madden and Betsey Johnson. Off season, you may need to consider an online specialty shop for a clear tote such as The Clear Bag Store, which offers several styles of totes appropriate for the beach, or Clear Safety Bags, which sells styles ranging from very simple totes to clear messenger and backpack styles that can be used as beach carryalls. Several different styles of transparent beach totes are available. Consider whech one will best meet your needs. The basic large tote has two shoulder straps and is a large, rectangular or square style like a standard tote. Straps are typically colored, metallic, or available in a fun print design. The bottom of the bag is often reinforced in the same style as the straps. Closure types of a basic tote style include snaps and zipper closures, and open types are also available. These beach bags come in small and large sizes, and have a great drawstring closure. The drawstring type closure adds style while also adding style to the tote. Bags may have colored trim where the drawstring pulls, and/or at the bottom of the bag. This style of beach bag has all the advantages of a standard clear tote, plus the added element of having your hands free. This sporty style may not always hold as much as the standard totes, but can be a great option for those who like the backpack style. 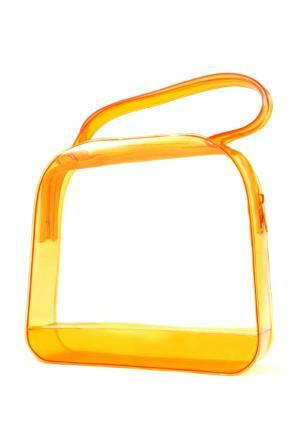 Clear zip mini totes can be handy for the beach for organizing and toting smaller items, such as sunglasses, sunscreen, small beach toys, magazines, or snacks. A clear tote can also be used to house car keys and other items to protect them from the sand, zipped closed, and placed in a larger beach bag or purse. Lastly, this type of tote makes a great option for kids to carry their personal items to and from the beach. Although kids are sometimes not eager to help with the chore of lugging items back and forth to the beach, they may be more likely to help with a cute tote of their own, and the see through design means it's easy for them to make sure they have all their belongings. Logos on clear plastic beach totes may be fun beach logos, or used as promotional totes. Clear promotional totes are an inexpensive option for companies to give away to entice customers to remember their brand, or can be a great product for nonprofit organizations to use with their logo for a spring or summer fundraiser. You can purchase clear promo totes at sites like epromos.com. Although the transparency of a beach bag can certainly be an advantage by allowing you to see everything inside, you may want to take a few precautions. Since the bag is clear, items like cell phones, iPods, wallets, and car keys make the clear tote an easy target for theft. Purchase a smaller printed bag that can be placed inside the tote and not be seen for these types of items, as well as things such as feminine protection which you may wish to keep discreetly concealed.